Common messaging architecture & utilities for facilitating the development and maintenance of stateful business processes & stateless services. Provide ability to reuse sub-processes across larger business processes. Tactical services introduce higher than necessary coupling between service providers and consumers and have brittle contracts that forcing service implementation changes on consumers. They do not reuse standard schemas and datatypes increasing data transformation and integration costs and could tightly couple service business logic and transport-specific logic. In short, tactical services inhibit reusability, increase maintenance costs and reduce the overall effectiveness of service oriented architecture (SOA) efforts. Lack of a conceptual data model – if there isn’t a conceptual data model, capturing key domain concepts and their relationships – it is natural that multiple service operations start to define concepts in their unique way. Insufficient coordination between teams building service capabilities within the domain – when teams don’t talk to each other, many opportunities to reuse schemas, service semantics, behavior, and utilities are lost. As the number of teams increase, there is a greater need for service governance and alignment across projects. Lack of coherent strategy tying business process management, business events, and messaging within the context of service development. Business processes could be service enabled and standard business schemas can be used to notify interested consumers. However,without an overall strategy – teams will look at these independently thereby increasing implementation costs and missing opportunities for greater alignment. Insufficient technical leadership – when confronting multiple projects that are either occurring within a short time window or back to back, it is critical to demonstrate leadership. Why? there needs to be strong voice evangelizing use of business facing services, loosely coupled interfaces, and mediating service requests. There are many organizations – large and small – undertaking SOA initiatives. As much as the technical infrastructure, message processing, service governance, and web service monitoring are important for your SOA you cannot afford to ignore the organizational aspects. In this post, I want to not focus on your entire enterprise but your department or a group of development teams undertaking SOA initiatives. When aspiring for SOA success you have to have more than developers and technical leads on your side. So who else needs to be involved? You need your requirements analysts, your data modelers, and production support staff all singing the SOA tune albeit in their unique voices. 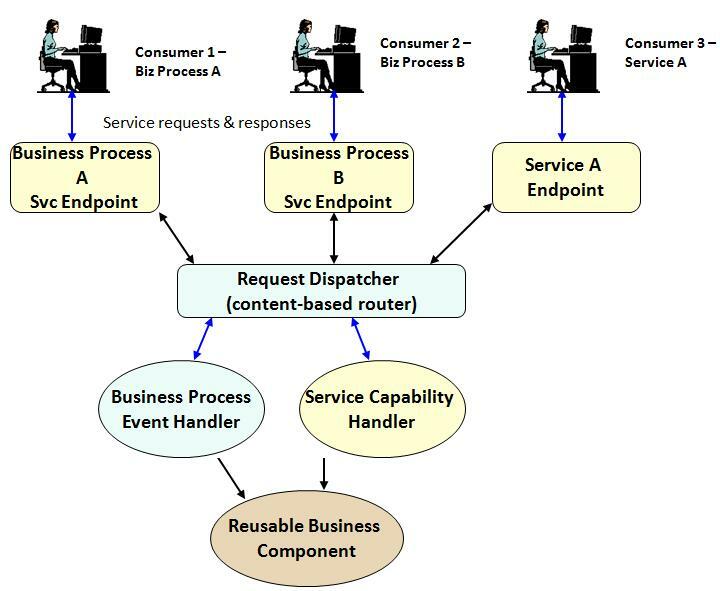 This post will talk about requirements analysts. Many developers underestimate the impact of requirements analysts (also referred to as system analysts or business analysts). Some analysts mix requirements with design offering specific solutions to business needs. Requirement specifications end up becoming design documents. Why is this a limiting factor for SOA? Because, you want to identity candidate services, reuse existing service capabilities, refactor legacy and modern assets and govern these service capabilities as part of your SOA strategy. Imagine, sifting through a requirements document that specifies implementing functionality as stored procedures or batch jobs. Without care, this can influence your thinking – knowingly or unknowingly binding you into solutions that are not in line with your SOA goals. You want your requirements analysts to specify the business processes the application needs to automate, enhance and the business capabilities required. You can then deduce the business services, the enterprise data services, and the BPM workflows that need to be developed. If your analysts are receptive you should persuade them to use a modeling tool that can specify an analysis model using a vendor neutral notation that can be imported into a BPM engine and converted into an execution flow. All said and done, the deeper point isn’t BPM or analysis model but about the what of the system. Using the what you can design the how. That is where SOA comes in addressing questions around what services you will build, which ones you can integrate with, which ones to decommision, and which ones to change. Requirements should clarify and not prematurely solve technical problems. Ask your analysts to provide world class requirements including functional and non-functional ones. Persude them to stay away from providing technical solutions so you can figure out how to automate your firm’s processes within the context of your SOA efforts. This isn’t easy and won’t be possible with every project but that shouldn’t prevent you from trying!